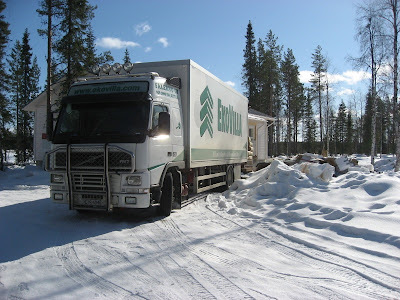 On Day 58 (1st April), another lorry arrived. 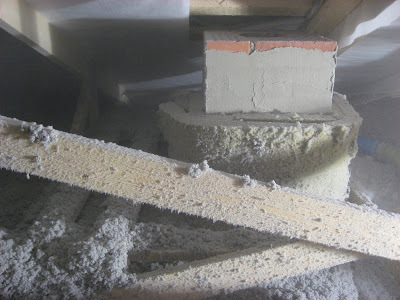 It was time to give the Our House its final bit of insulation, which was to be blown across the floor of the loft. 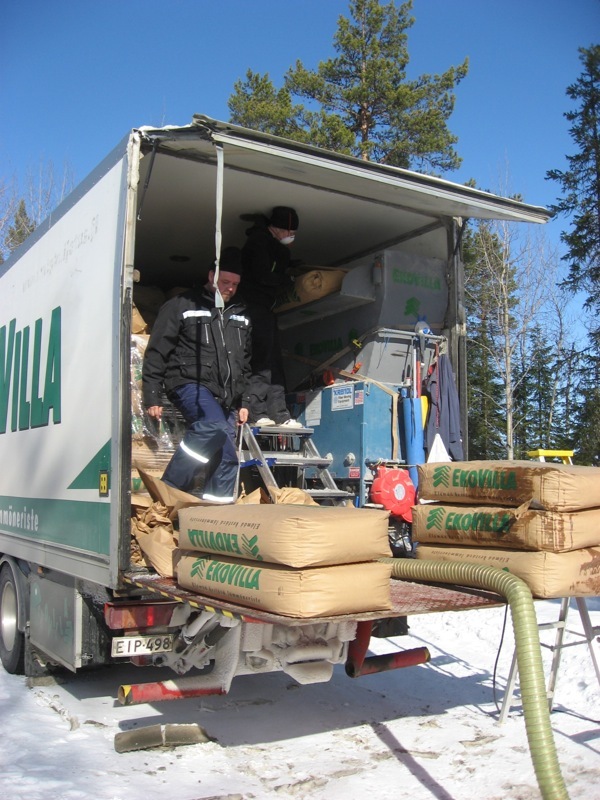 The lorry was fully loaded with a material called Ekovilla, which is an insulating wool made of recycled paper. It comes in paper sacks, and is fed into the machine at the back of the lorry, which gives it a good mix, and then blows it through a hose into the loft. In the loft, one person simply guides the hose until the correct thickness of material is achieved. 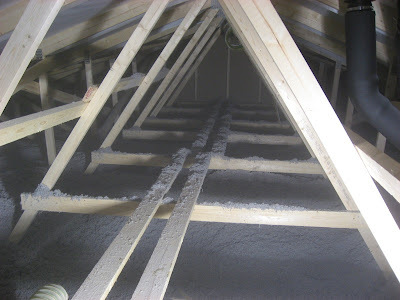 In our case this was 45 cm of Ekovilla, on top of 10 cm of mineral wool. This should keep us warm in winter, and prevent us from overheating in summer. The photo shows Ekovilla being blown in. 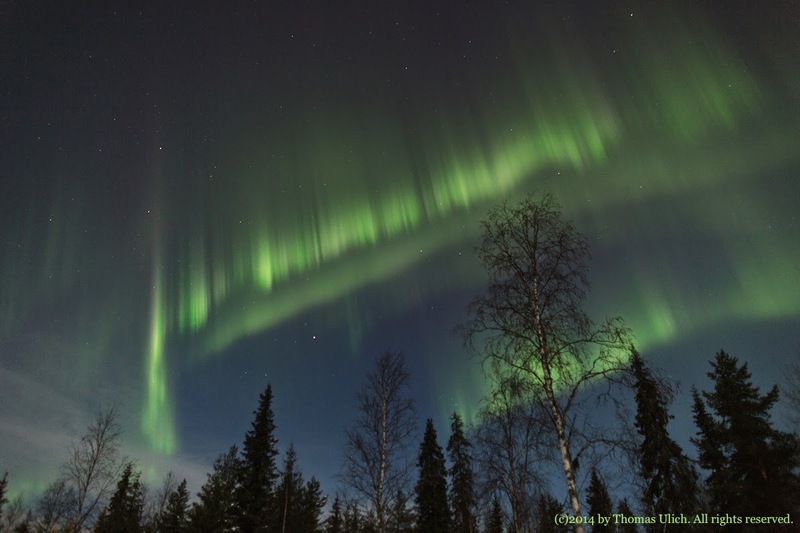 This is what the area looked like afterwards. The product name "Ekovilla" means "eco wool" in English, and it is very ecological, consisting entirely of recycled paper. 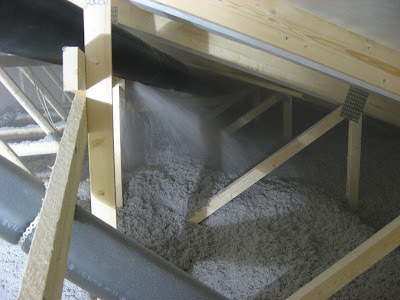 The process is very dust, and paper fibres are everywhere. Of course during the process face masks are an absolute must to wear. Otherwise Ekovilla is simply a dry, grey, fluffy substance. However, it compresses well when stepped on, and I am happy we took the advice and built a pathway across the entire loft for later access.